One of the first questions posted on our site was from John asking for a way to keep the good properties of naturally leavened sourdough while minimizing the actual sour taste. I have to admit that I’ve often come across people new to the sourdough experience complaining that the bread is too sour. I suspect that the white poison (sugar) permeated throughout our food industry has altered peoples sense of taste, creating a baseline far from that of our not too distant past, when all bread was ‘sourdough’. Be that as it may; what I was curious to read was Boris’ reply to John giving a solution that looked to me like a perfect home baking experiment: Project Semolina. Over Christmas I had planned to make some bread for my friend Tim and his son Sebastian, who really love eating my bread. One of the most satisfying things with baking bread is when someone eats it and really loves it, lavishing you with praise. It makes it all that much more enjoyable to do – not that I don’t enjoy doing it, but if someone really likes it, its like the pleasure a grandmother gets spoiling her grandchildren with some nice chocolate cake or cookies and milk. As it turned out, with the trip to Tasmania close on the heels of Christmas, I didn’t get a chance to do Tim’s Christmas loaf. But the Australia Day weekend was a perfect time to kill two birds with one stone: bread for Tim and project semolina for me. 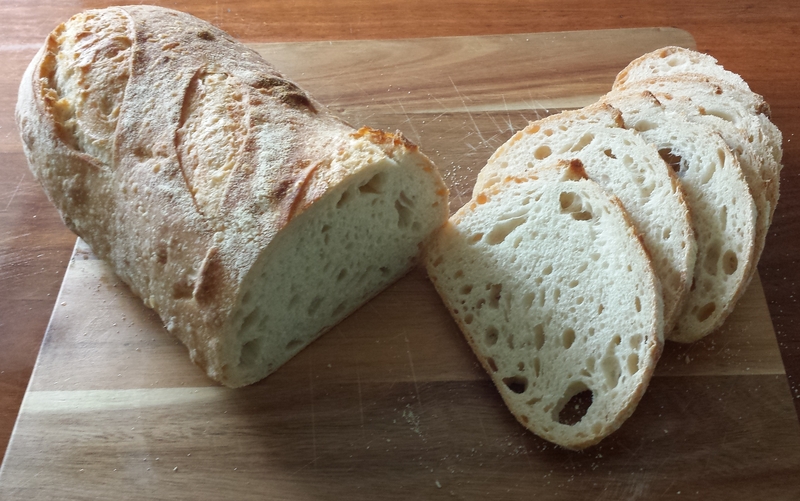 Also, I saw it as a perfect opportunity to do some more testing of my sourdough app. With Boris’ help (or more accurately without my help) we created the recipe on the app. Screen shot of Semolina white bread recipe in BreadBoss app. The recipe settings tell the app how large you want each loaf to be and how many you want in total. It uses this to calculate the total amount of flour needed, which always gets rounded up. You know how easy it is to lose dough during the mixing and kneading – I remember once finishing all the kneading and was cleaning up the bench and utensils, when I noticed on the window (which is behind the kitchen bench) a big blob of dough oozing down the glass like a big white slug – I can’t even imagine how the hell that got there. Scrolling down through the recipe definition we defined the details and ingredients of the final dough. 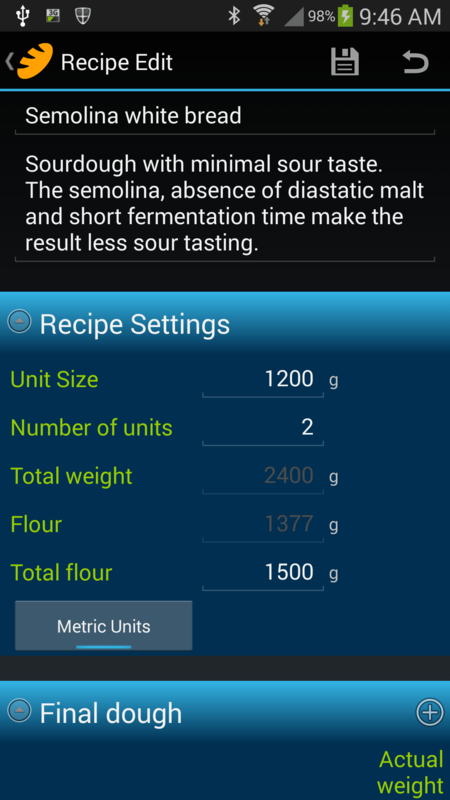 Screen shot of the recipe’s final dough details and ingredients for the Semolina white bread recipe in the BreadBoss app. The more learned bakers amongst us will know that bread recipes or formulas are defined in terms of percentages of the total weight of the flour. As a novice it took me a while to come to understand what this means and how to use it; I kept thinking that the percentages were of the total, surely the more natural way to think of it? Even more difficult was accepting it as the recognized practice of professional bakers (or should that be master bakers) and towing the line. But once you get your head around it then you come to realize that it’s less bizarre than the units of measure that most cooking is done with. Anyway, the important thing to note is that the total flour is made up of 30% semolina and there is no diastatic malt. Boris nicely describes the rationale behind this in his response to John, so I’ll not reiterate it here. Finally the fermentation times are short and no refrigeration mid way through the final dough’s. 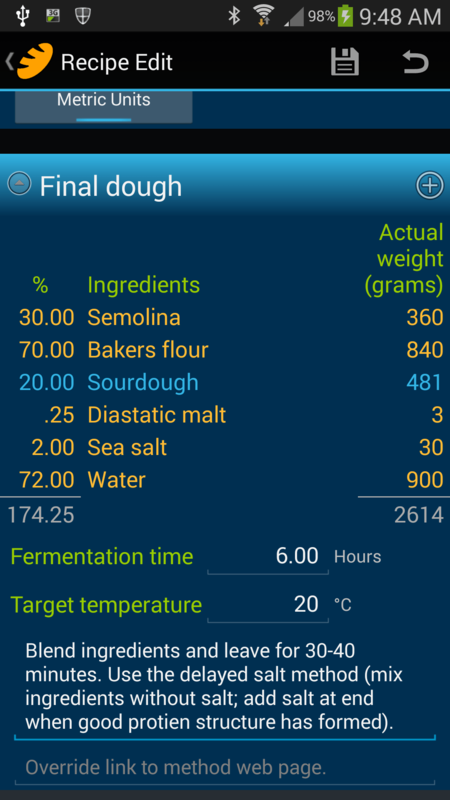 The final screen shot shows the sourdough’s formula. Nothing significant to note here except that the starter and sourdough are both 20%, again to minimize the amount of acidity that will build up during fermentation. 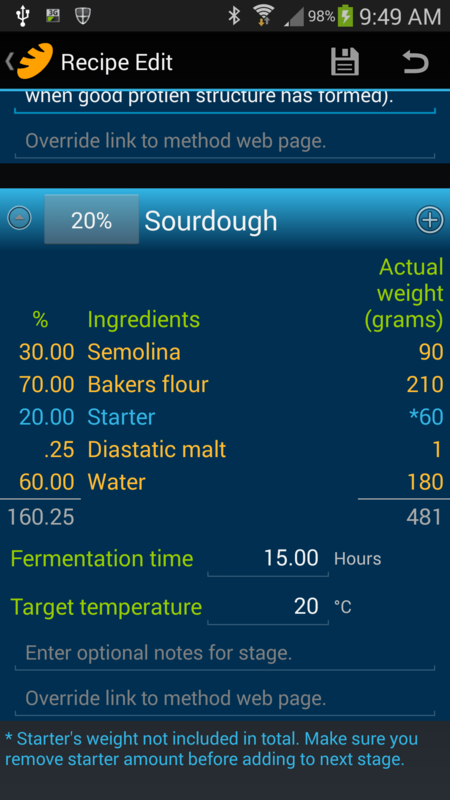 Screen shot of the recipe’s sourdough details and ingredients for the Semolina white bread recipe in the BreadBoss app. I started the sourdough at 7am and although at that time my app still hadn’t implemented the ringing of alarms it did create a default set, allowing you to see your schedule for the day (see image below). Being a public holiday and raining it seemed like a perfect day for relaxing at home tending my flour garden. Pun intended and it’s not that far from the truth – natural bread making is the process of developing an ecosystem of micro-flora and fauna that alter their environment to produce the result that we want. The industrialization of food is only concerned with producing a superficial copy with profits as the only incentive – crash! Whoops, just slipped off my soap box. When it came time to do the final dough I had to check with Boris about the “delayed salt method” he put in the recipe. 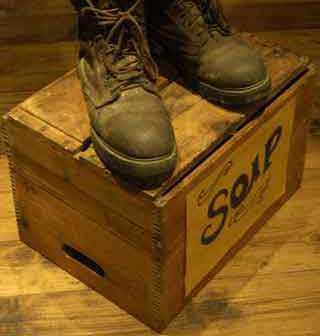 I’d used it once before on some very high protein flour when we were in Tasmania. That was the first time I’d used that method and just wanted to get it clear in my mind how to do it again. I needed to mix all the ingredients together except the salt (leaving this for the end). 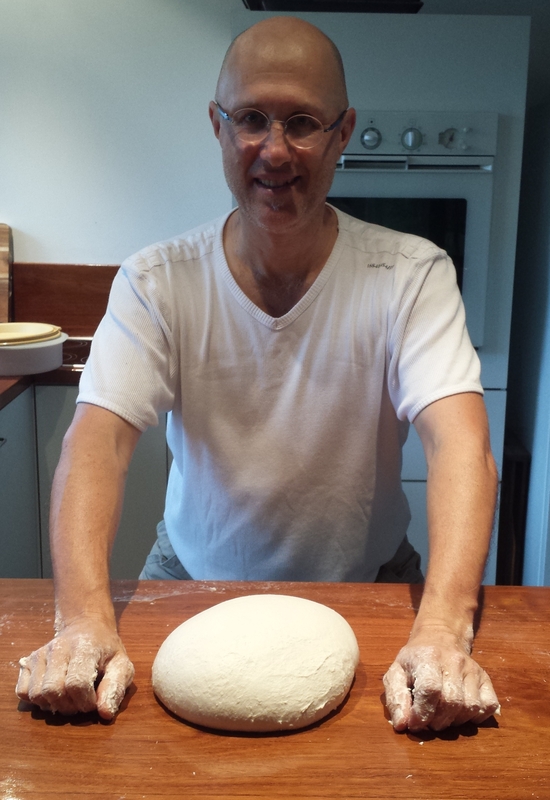 Me with finished semolina dough. It looks like I’ve been sitting down at the job, but I’ve just squatted down a bit to compress the image. The flour I was using was a typical bakers flour from a local bakery. I wont mention their name as they’ve increased their price for a 12kg bag from a reasonable pseudo-whole sale price (meaning they still made a big profit) to basically the same price I’d have to pay at the supermarket across the mall – except the supermarket flour was high quality and high protein flour. So I’ve now decided that I’ll just have to keep supporting the damn duopoly supermarket chain. The baker was a large multinational chain anyway, so I guess it’s not that much of a shift of support. I tried to get some flour from the local independent baker but he was not willing. I guess they’d prefer to sell me “value added flour” in the form of bread. Sourcing flour always seems to be the biggest issue when you’re not able to buy huge quantities. I guess that’s just another part of the home baker puzzle that each of us needs to solve in our own unique way. 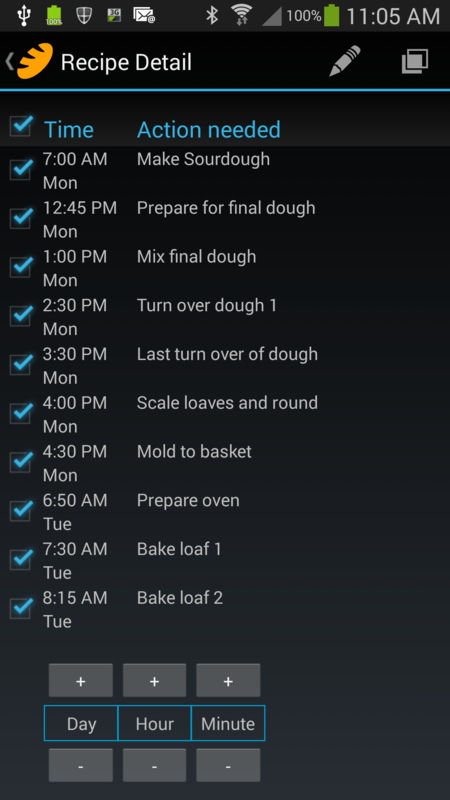 Screen shot of the recipe’s alarms in the BreadBoss app. 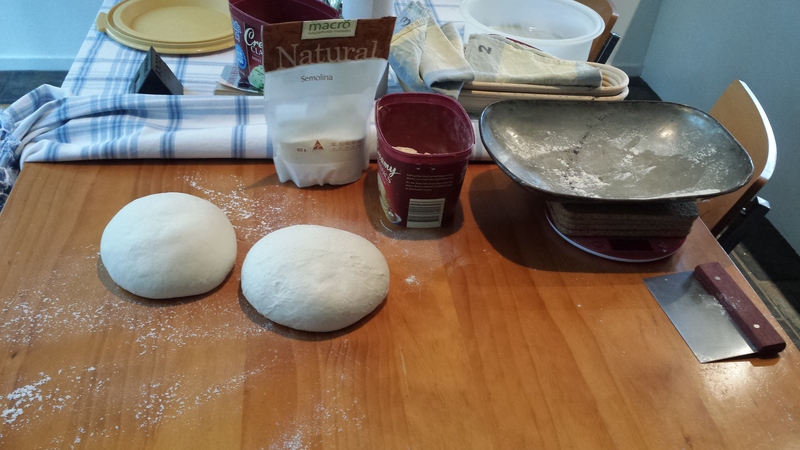 Mixing the dough without the salt turned out to be surprisingly easier than my usual experience. I’d noticed that the mixing of the high protein flour in Tasmania was pretty easy at the time and Boris explained that due to the high protein the salt was not added till the end. When the salt is added it results in the proteins toughening and consequently kneading becomes a tougher chore. It’s also apparent that the salt competes with the protein for water reducing protein hydration early on in the dough making process. So with the semolina dough (although the flour was not high protein) the kneading turned out to be much easier without the salt and I was able to get the right gluten structure in about half the usual time I’d take to beat up my 2-3kg doughs. Now I’m starting to think that Boris didn’t tell me about this earlier just so he could watch me sweat it out ;-). I spoke to him the other day and he confessed that he’d not really thought to tell me before and that in the old days, before machine mixers, the salt was usually added at the end. So I’m now changing my default method to always be delayed salt. As can be seen in the featured image at the top, wearing jewellery is a bad idea when mixing dough. That’s my gear ring in the picture and I had to leave it to soak in water to clean out the cogs. I usually remember to take the trinkets off, but this time I forgot and Jessy (my daughter) managed to take a nice snap for me. 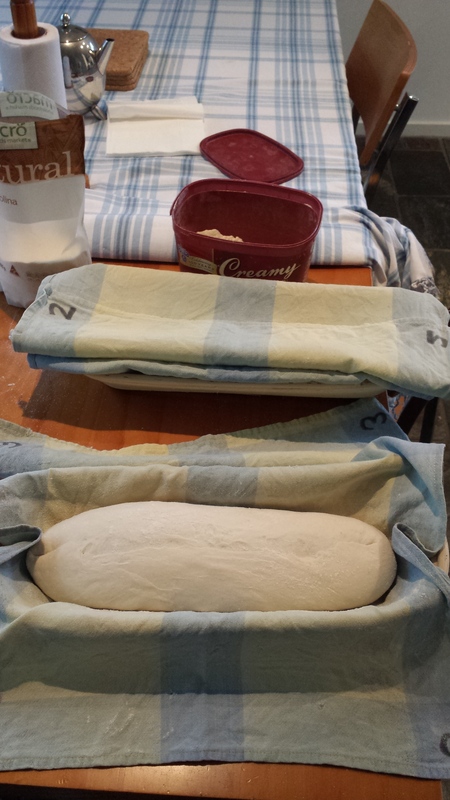 The fermentation time was short, so it wasn’t long before I had the dough scaled and sitting in my baskets. And of course, as all good things in the making should go, nothing noteworthy happened. 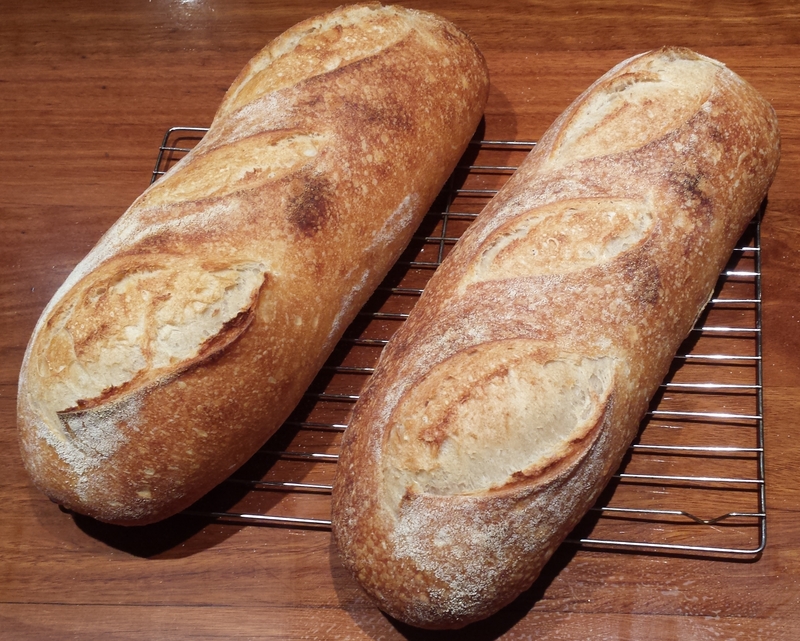 By mid evening we had two beautiful white loaves of sourdough bread. The proof is of course in the look, feel and most importantly: the tasting. I was quite surprised to discover that the bread was not at all sour (although I personally quite like the usual slightly sourish taste). This was fantastic bread and really easy to get my teenaged son to eat (tricky, if like many kids, their idea of great bread is fairy bread – yuk). Semolina sourdough bread fresh out of the oven. Semolina bread cut for tasting. 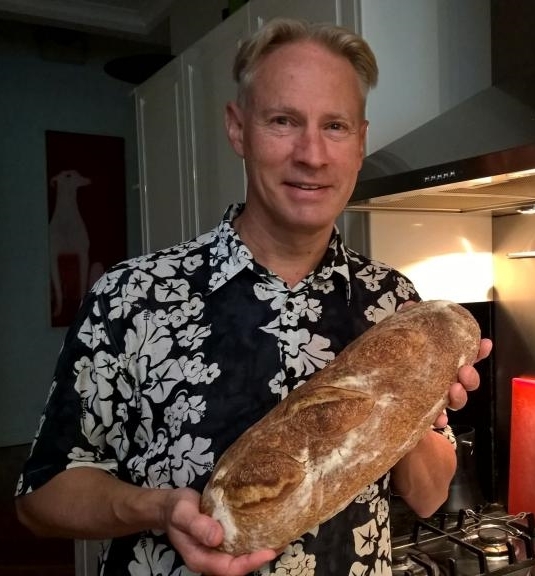 Happy Tim with Christmas loaf.